The Beards have gained somewhat of a cult following since their formation in 2005, for what was supposed to be a one-off show. They have since toured extensively across Australia and internationally, including a spot at the Big Day Out in their hometown of Adelaide in 2008 and 2009. While their success may have come as a surprise to some, for Facey it was perhaps more of a natural progression. The Maton-sponsored guitarist first picked up the instrument at the age of 10, after undertaking formal piano and vocal training for several years. “I had a bit of classical training, which helped no doubt in developing an ear for good music, though honestly my music didn’t really take off until I was old enough to grow a beard,” Facey said. “I pretty much graduated then from Kurt Cobain to Van Halen in a matter of weeks. Whilst the Maton web site claims fellow Maton artist Tommy Emmanuel had a huge impact on Facey, he said differently. “I would like to publicly slam Tommy Emmanuel,” he said. Facey said he had “blocked out any memories of life prior to having a beard. Asking how The Beards formed originally is like asking how gravity came about, according to Facey. “When this amount of facial oppression occurs in society, people are bound to stand up together and make a difference,” he said. With the current trend for facial fur, thanks in part to the hipster movement, Facey said he believes the movement is gaining a following. “I don’t like to think there is any kind of bad reason for growing a beard, even to be part of a hipster trend,” he said. “But I must implore the hipster generation, once it becomes uncool again to have a beard, stand up for your rights and do not shave. “Big, small, patchy, ginger – any beard is great. “Shaving is just a ploy from Shick and Gilette – don’t buy into it. Facey said the beauty of having a hairy muse was the fact there was always something to write a new song about. “I don’t think we’ll ever run out of things to say about beards,” he said. “It’s an inevitable part of the human psyche, there’s always going to be peaks and troughs in levels of creativity. Far from keeping fans far away from their beards, the band actively encourages people to touch them at their shows. “Ultimately it is not about us at all, we are merely vessels for the beards,” Facey said. So is there ever a fear of snippy stalkers? 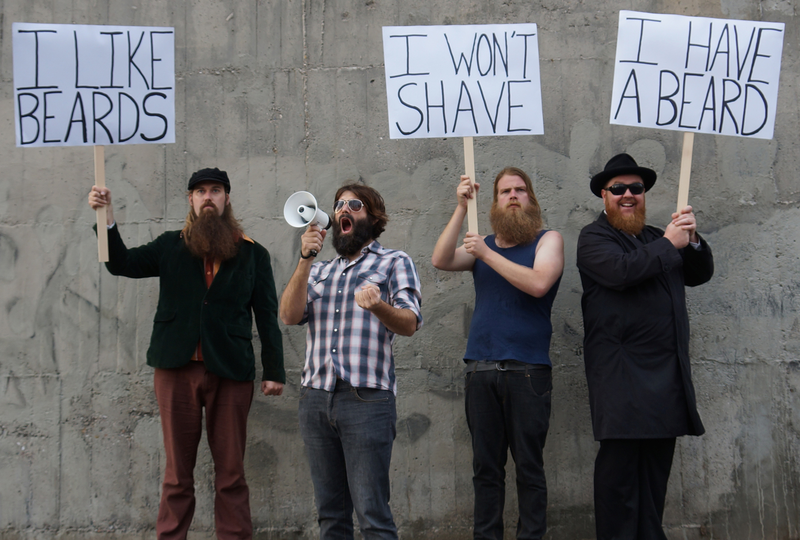 Singing the praises of having a beard has taken the band overseas, and seen them perform at such prestigious beardy events as the World Beard & Moustache Championships opening ceremony in Alaska. “That event was held in Anchorage, which isn’t the capital, it’s actually a port town in Alaska,” Facey said. “The interesting thing about Alaska is that it was actually another place that Captain Cook found… now, he was a beardless chump, so I don’t even know how he managed to find any of these places they say he did. The Beards will be embarking on an extensive three-month tour of Australia once they have finished recording this album. “We have toured quite extensively in the past, but not really when anybody was paying that much attention,” Facey said. “In 2010 we played 133 gigs in a calendar year – I know that because I do all of our APRA returns. The Beards will perform at Bluesfest in Byron Bay this month before kicking off their headline tour in New Zealand on Friday 2 May then criss-crossing the country bringing beard love to all. For dates and ticket info, visit The Beards official web site.